Welcome, newcomers. The tradition of Festivus begins with the airing of grievances. I got a lot of problems with you people and now you’re gonna hear about it. Both of these games, for some reason, were color vs. color match ups — normally a good thing — but these two really didn’t work out at all. 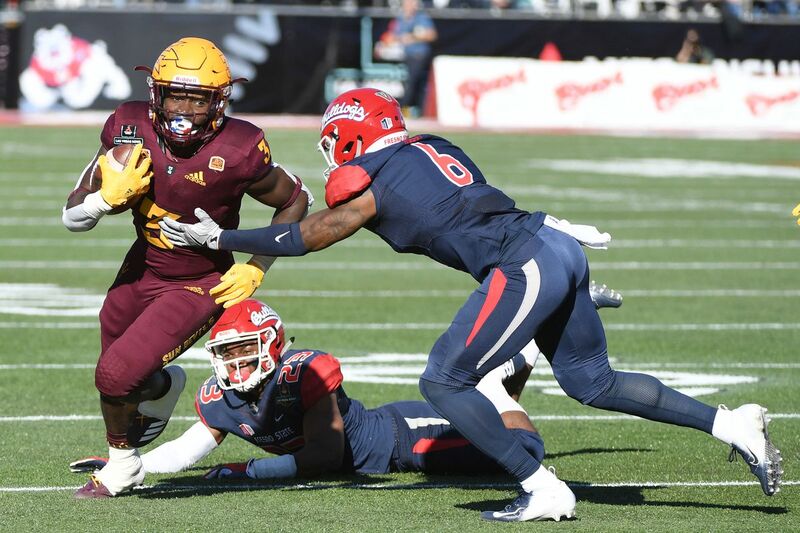 The Las Vegas Bowl, played last Saturday, featured the Fresno State Bulldogs, clad in mono-blue unis, versus the Arizona State Sun Devils, dressed in mono-maroon. At least they had contrasting helmets. But the resulting color vs. color game was both hard to watch and a terrible looking game. 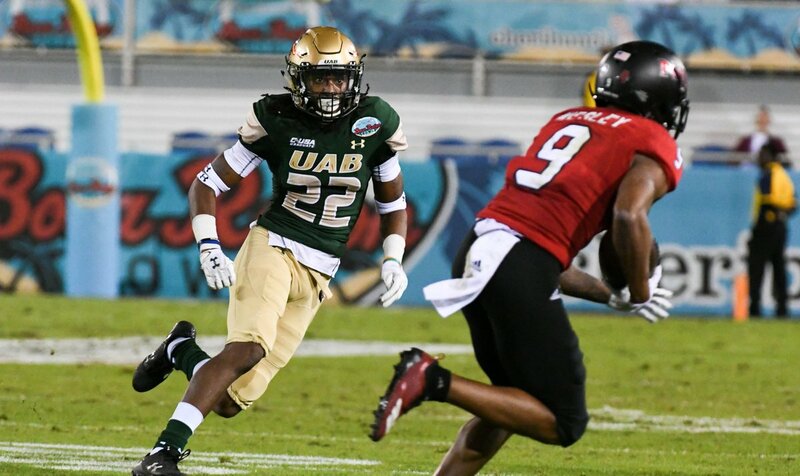 The other color vs. color game: the Boca Raton Bowl, matched up gold/green/gold UAB vs. black/red/black NIU. This one wasn’t as bad, but it was still rough. It wasn’t so much that you couldn’t tell the teams apart (you could), but it just was a visually muddled mess. I’m normally a fan of color vs. color games, and we’ve had some good ones — especially rivalry games — like the Holy War, the Cocktail Party, the Victory Bell and the Civil War…ahem, the Civil War. 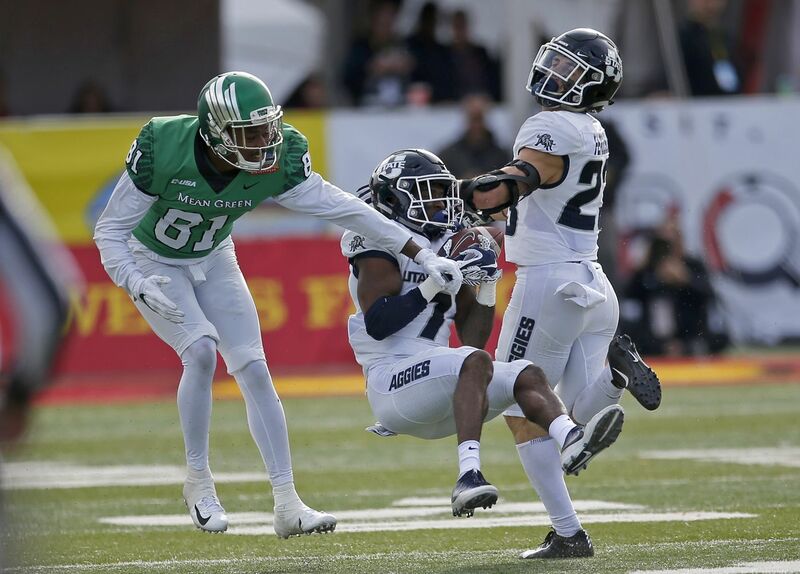 │North Texas vs Utah State│ We kick things off with an inoffensive matchup between the University of North Texas Mean Green, in –aptly so– green helmets and jerseys, with white pants. 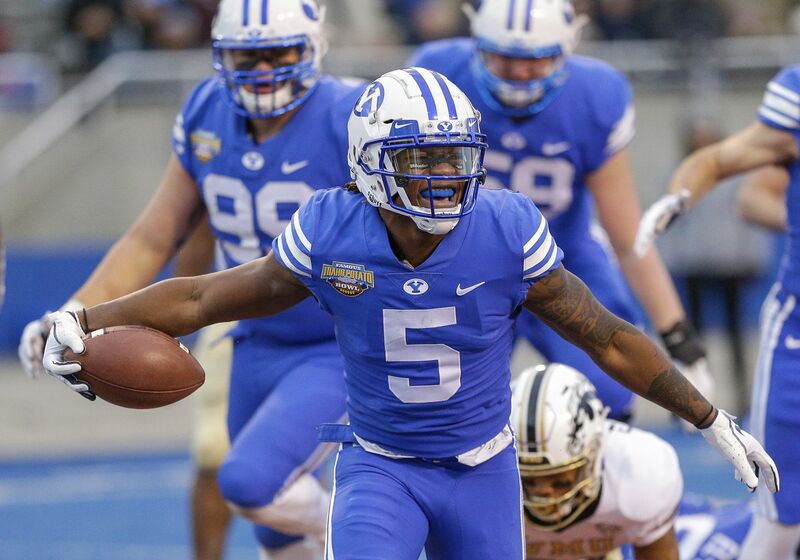 Their opponent: the Utah State University Aggies, who wore navy helmets with a monochrome white ensemble. Not entirely an eye-catching matchup uniform-wise, but far from ugly, and I consider it a victory when you can actually tell who’s who. 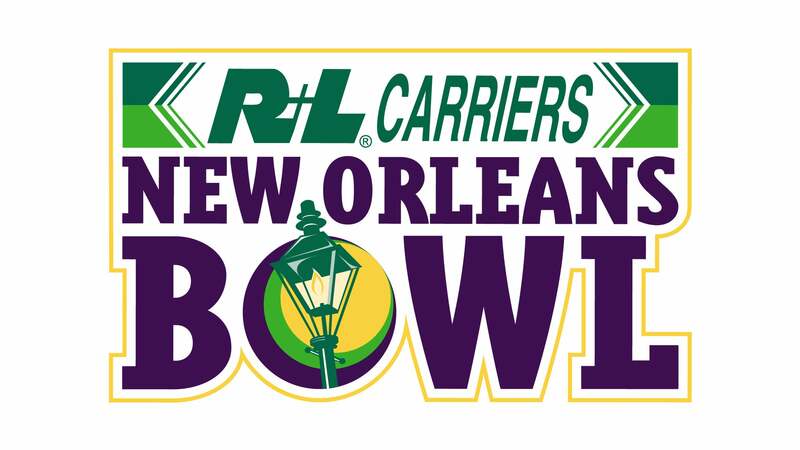 │Louisiana vs Tulane│ An in-State matchup… that’s out of State. Huh. How ’bout that. 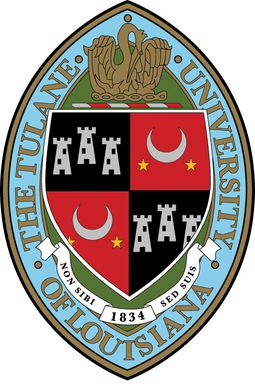 Two Louisiana programs face off in Florida (Orlando, specifically), as the Ragin’ Cajuns of the University of Louisiana at Lafayette square off against the Tulane University Green Wave (who have one hell of a seal!). 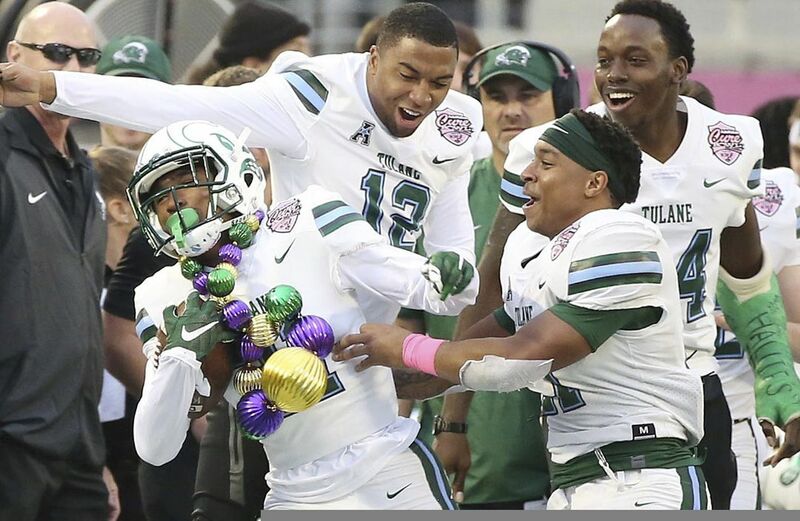 Interestingly enough, Tulane wasn’t lookin’ so green last week, not only because they won their bowl game 41-24, but because they took the field in all-white, and check out the helmets they sported for the occasion (closer look). Louisiana wore all-red, one of the few teams I love seeing in top-to-bottom monochrome (non-white). 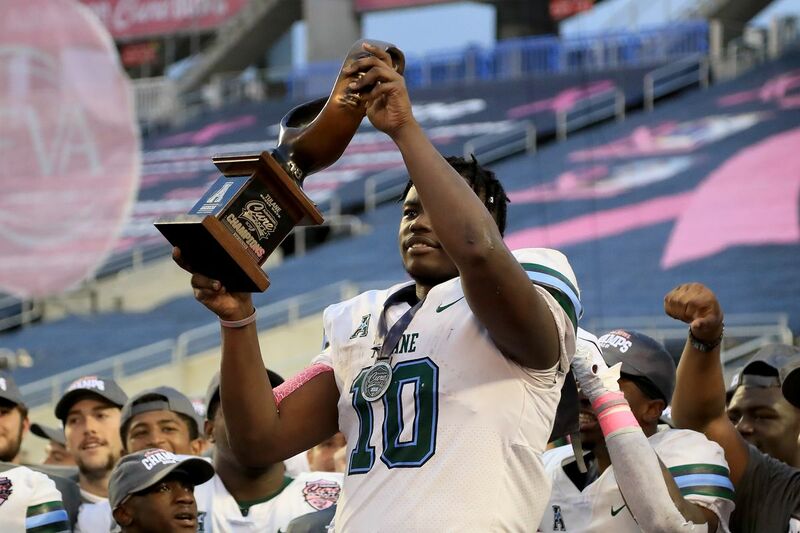 Also, Tulane brought a little piece of New Orleans with them to Orlando (I assume it’s similar to the Turnover Chain/Belt/Hammer/Sandwich/iPhone/etc. that every school seems to have in 2018). │Arizona State vs Fresno State│ My rule of thumb is if you’re going to do something, do it the right way. 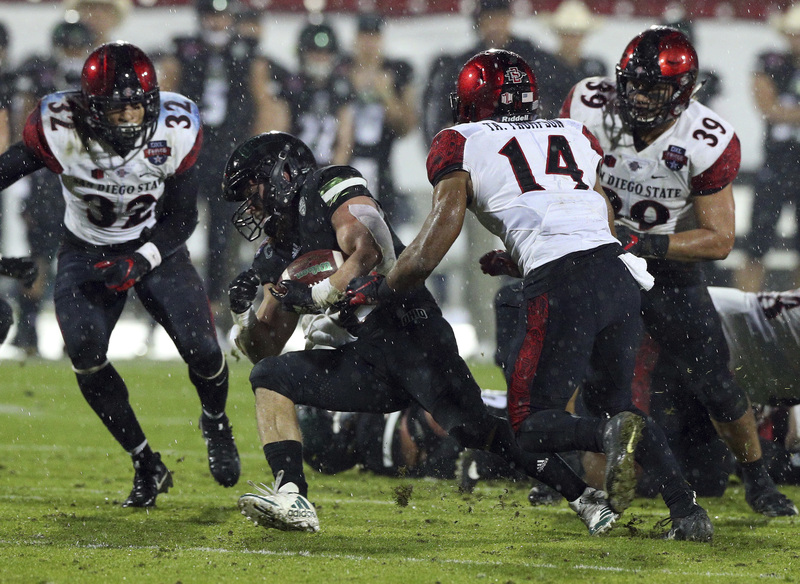 This is our first color-vs-color game of the 2018 bowl season, and it features the Arizona State University Sun Devils, and the Bulldogs of California State University, Fresno. 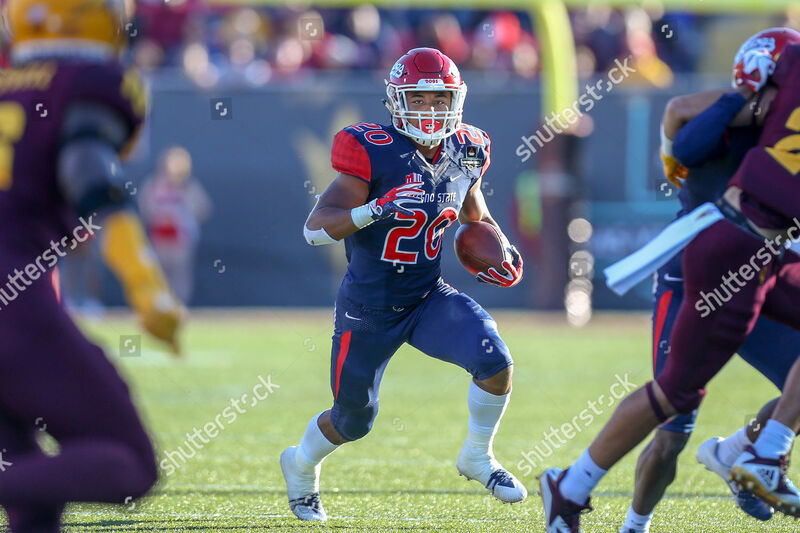 As you can see, Arizona State wore yellow/maroon/maroon, and Fresno State showed up in red/navy/navy. And the visual ramifications of it all were… well, see for yourself. Or don’t, you’re probably better off looking away, because this was one of the most eye-crossing-inducing games I’ve seen all year. And what’s worse is in certain lighting (or lack thereof), Fresno State looks like they’re wearing Grey For Grey’s Sake jumpsuits! Who do they think they are, Houston? Luckily, the Cougars chose to look like a football team, but we’ll get to them in a few moments. The only saving grace in terms of being able to discern who’s who are the helmets. It seems like I’ve said this at least 2,456 times this entire season, but it almost clearly bears repeating: CONTRAST. MATTERS. R.I.P. to anyone who watched the game on an old black ‘n’ white T.V. 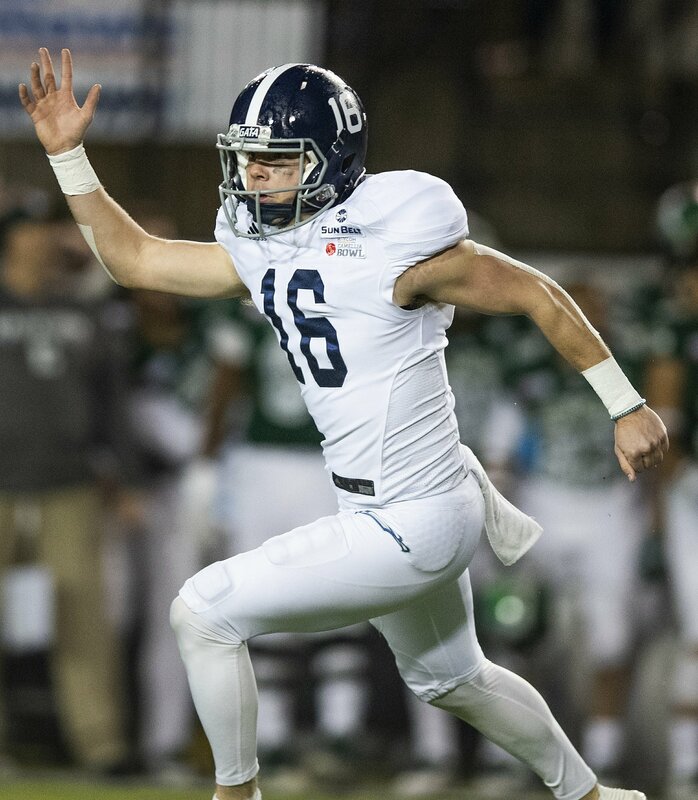 │Eastern Michigan vs Georgia Southern│ Eerily similar in aesthetic to our earlier matchup between North Texas and Utah State (except substitute Nike for Adidas), we have the Eastern Michigan University Eagles in green/green/white, and the Georgia Southern University, um… Eagles, in navy/white/white. 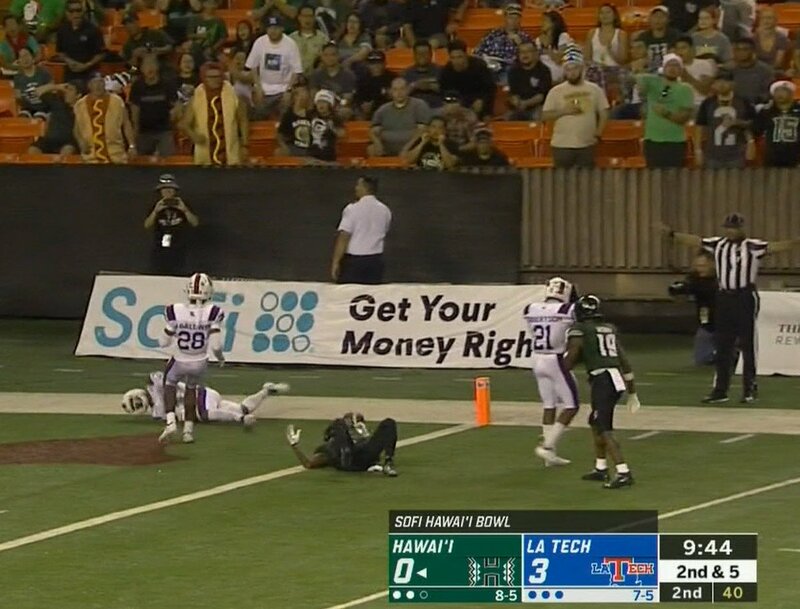 Again, very inoffensive in appearance, and a decent pallet cleanser to the ASU/Fresno State tomfoolery from before. │App State vs Middle Tennessee│ This year’s contest is easily the best-looking game from the December 15th (apart from Tulane/Louisiana), as the West Virginia Appalachian State University Mountaineers wore all-black, while the Middle Tennessee State University Blue Raiders wore a handsome and inoffensive silver/white/silver look that is very much an MTSU uniform. Definitely a huge improvement from what they were wearing just a couple of years ago. As for App State, I love this look, but I would love to see the two yellow stripes mirrored on the helmets and pants. 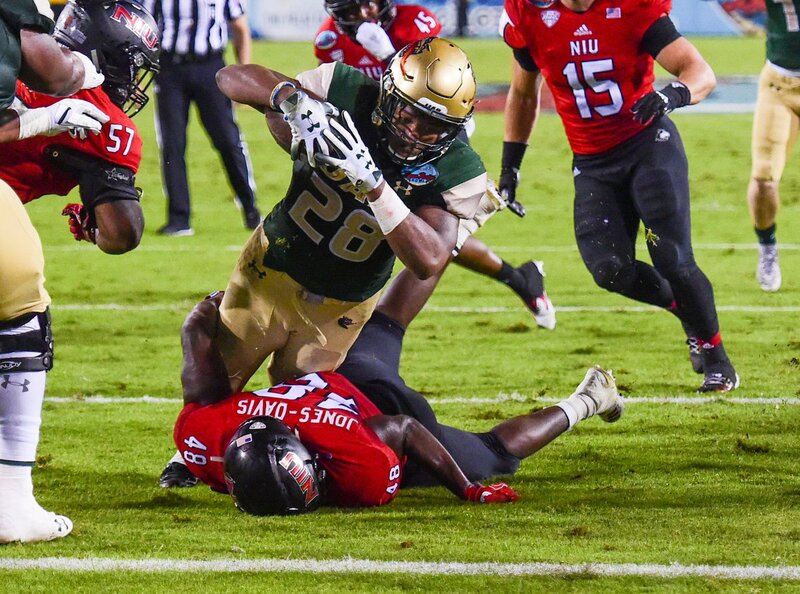 │UAB vs NIU│ Our second color-vs-color bowl game comes via the pairing of the University of Alabama (at Birmingham) Blazers in gold/green/gold, and the Northern Illinois University Huskies in black/red/black. 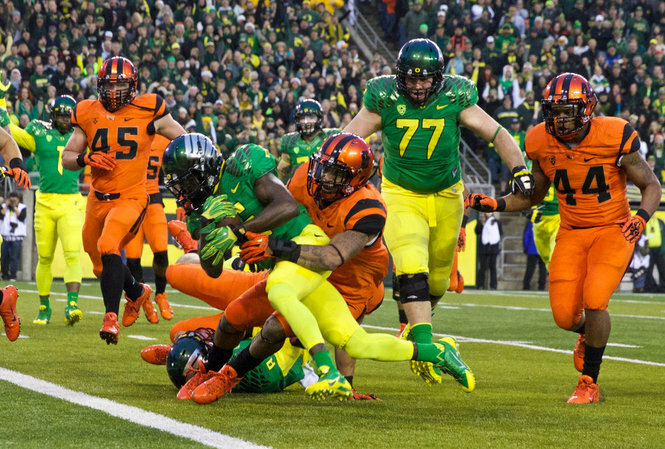 Not a super-ideal site to behold, but at least the helmets and pants give enough contrast to not make my blood boil. 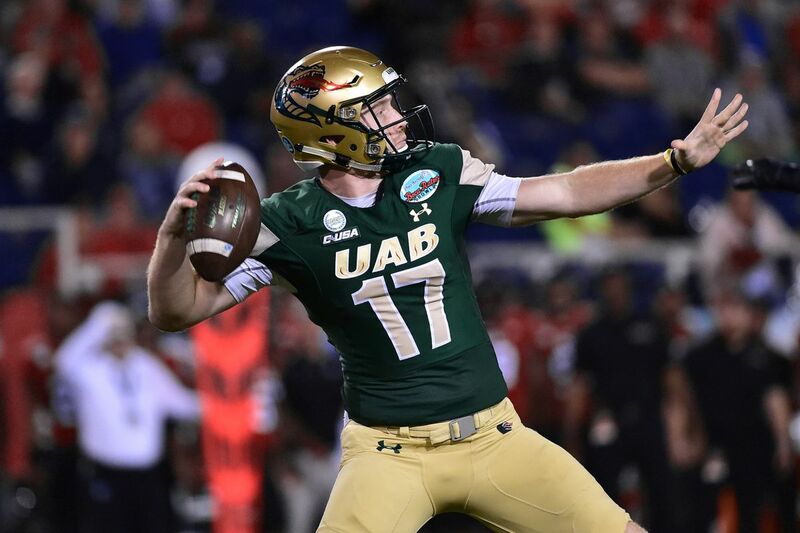 Congratulations to UAB, a team who’s football program went the way of the Dodo only a couple of years ago, for winning your bowl game. 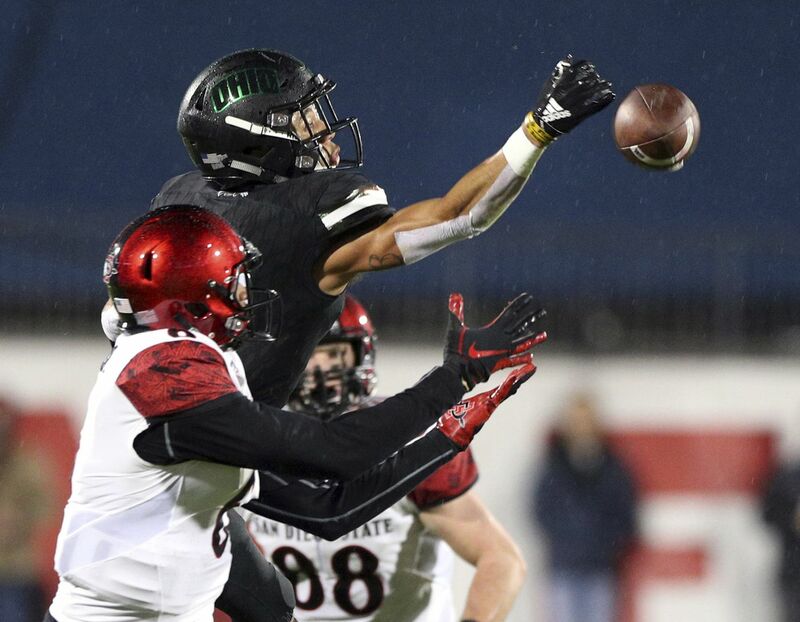 │Ohio vs San Diego State│ The Ohio University Bobcats –to put it simply– didn’t look like the Bobcats on Wednesday night, but then again, that ship has long since sailed. 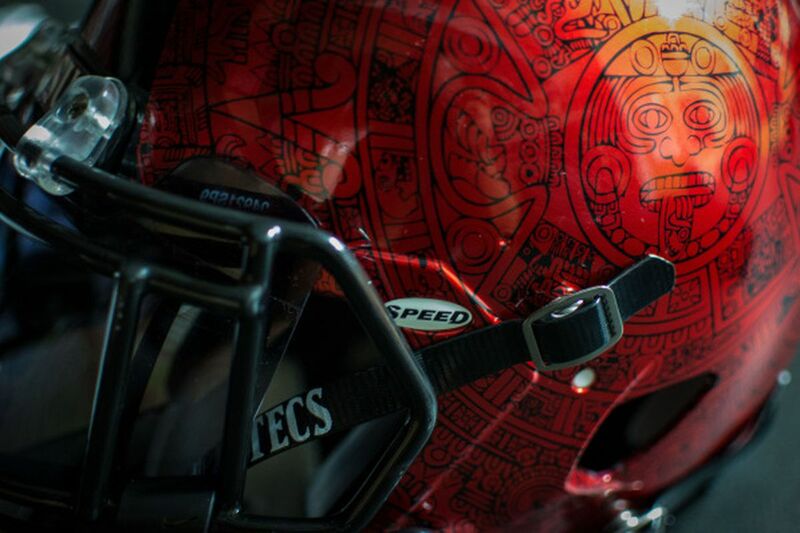 They wore all-black with some of the most incognito helmet decals I’ve ever seen, against the San Diego State University Aztecs, who wore their beautiful Aztec calendar helmets (couldn’t find a game pic, but it’s their regular helmet), white jerseys, and black pants. 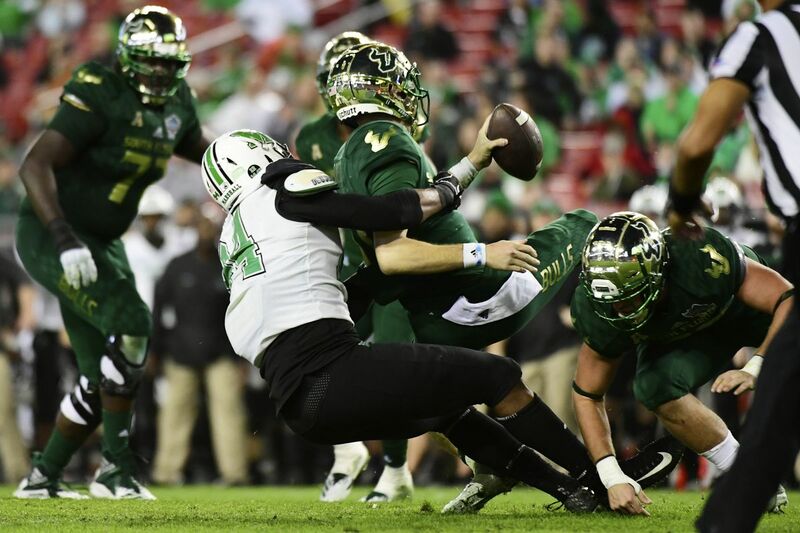 │USF vs Marshall│ At the risk of sounding like a Debbie Downer, this matchup was just visually non-stimulative (is that even a term?). 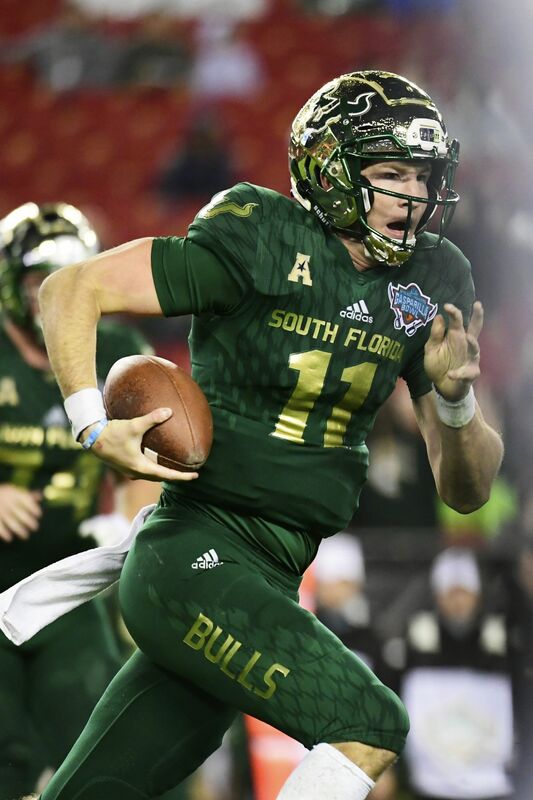 We have the University of South Florida Bulls in gold-chrome lids, paired with mono-green, against the Marshall University Thundering Herd, who were wearing WAY TOO MUCH BLACK FOR THEIR OWN GOOD. I know how much potential they have to look great on the road! Why this?! Nevertheless, given that they won their respective bowl game, I suppose they couldn’t care less what I think. │Toledo vs FIU│ Pretty vibrant game, and fittingly so, given the playing grounds. The University of Toledo Rockets wore yellow/navy/navy, while the Florida International University Panthers wore all-white (sorry about the pictures for ants: finding game photos for this tilt proved to be difficult). 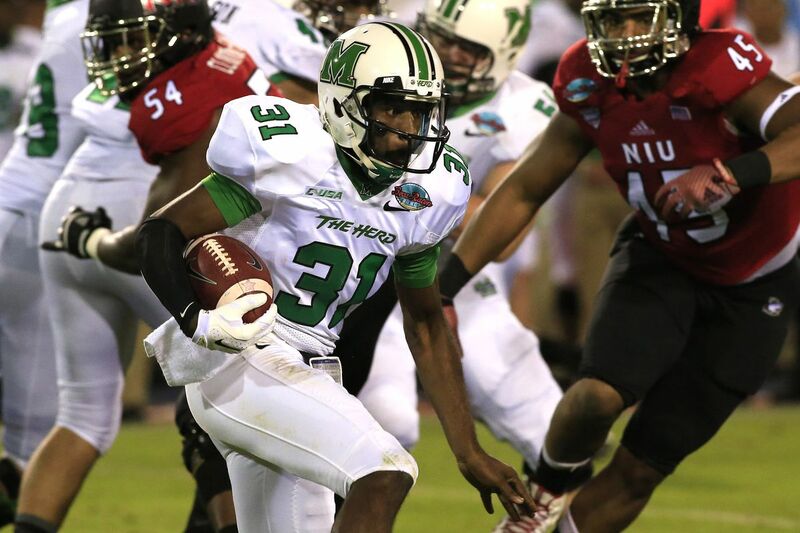 I should also note that Toledo wore a Rockets rendition of the flag of the Bahamas on the left side of their helmets. 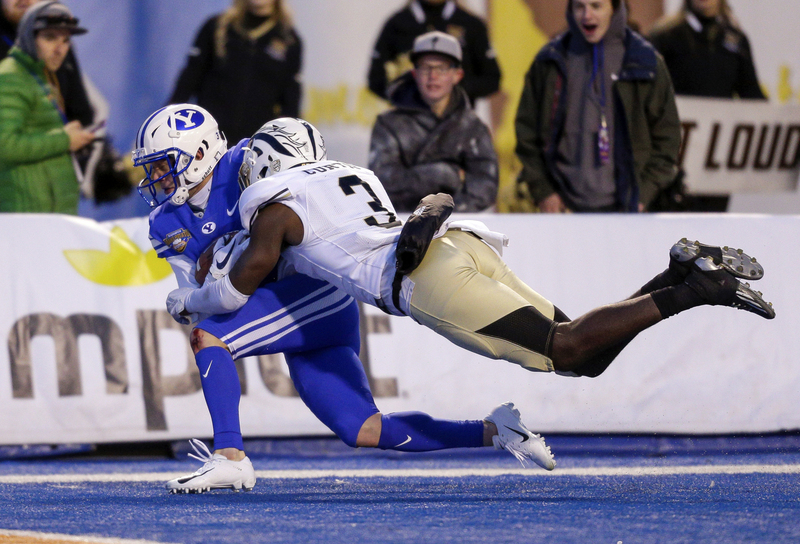 │BYU vs Western Michigan│ Never thought I’d see the day that sentient helmets would take the place of football players. Western Michigan must have been terrified whole game, given the score. 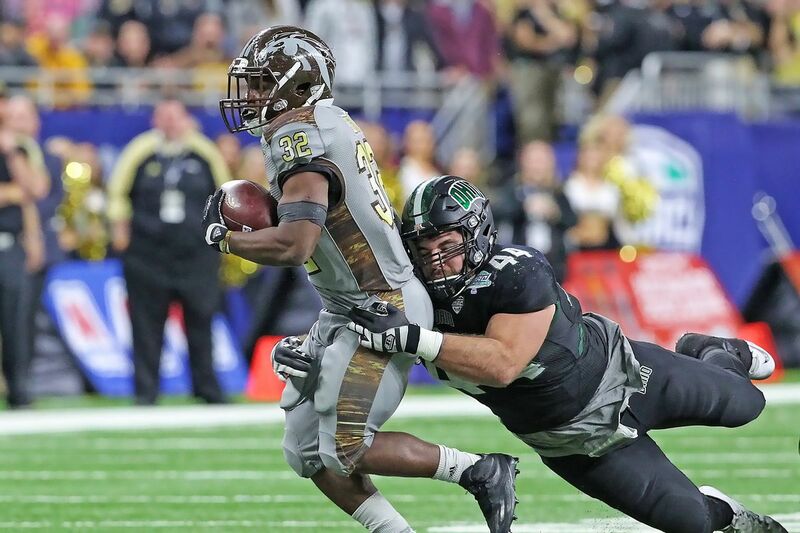 This matchup featured the Brigham Young University Cougars in white/royal/royal, and their opponents –the Western Michigan University Broncos– wore white/white/gold (more tan-like, but besides the point). To touch on WMU again, I absolutely loved this look they sported (although that fishy business at the back of the legs can go), and bear in mind: this is the same team that I TOOOOOORE into when they “blessed” our eyes with this look just two years prior. 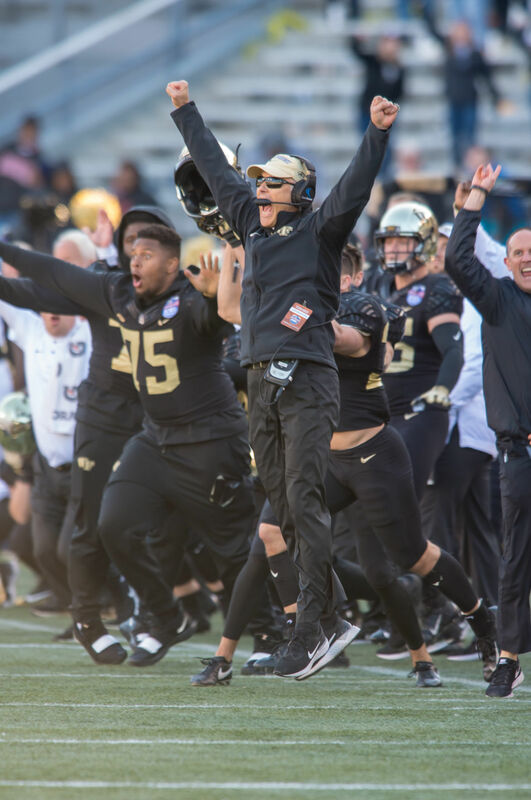 │Wake Forest vs Memphis│ Nothing like a thrilling finish to kick off your Saturday. 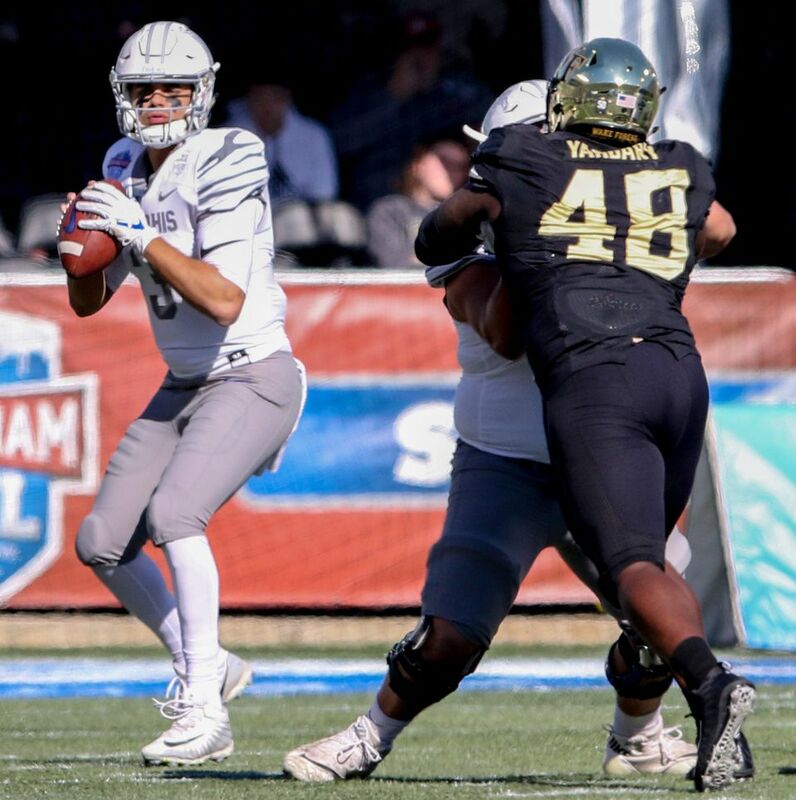 Here, we have the Wake Forest University Demon Deacons in gold-chrome helmets and mono-black, facing off against the University of Memphis Tigers in their drab, greyscale version of their proper road uniform. Memphis, you’re capable of so much more. 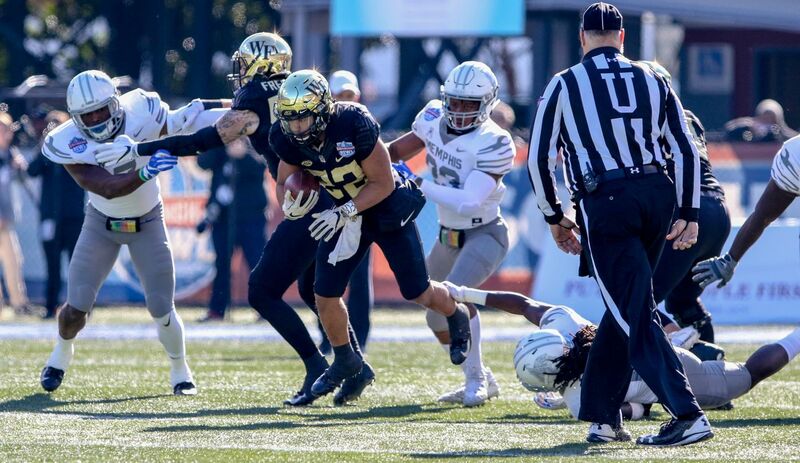 At least the sunny day and surprisingly decent-looking Wake Forest togs helped to make the game palatable. │Army vs Houston│ Houston, we have a problem. 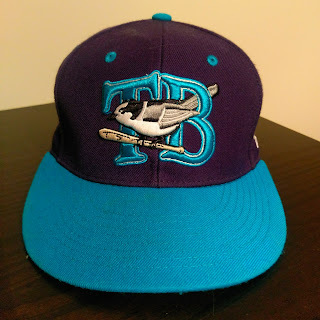 This game was an upper echelon of a BEAT –and I cannot stress this enough– DOWN. 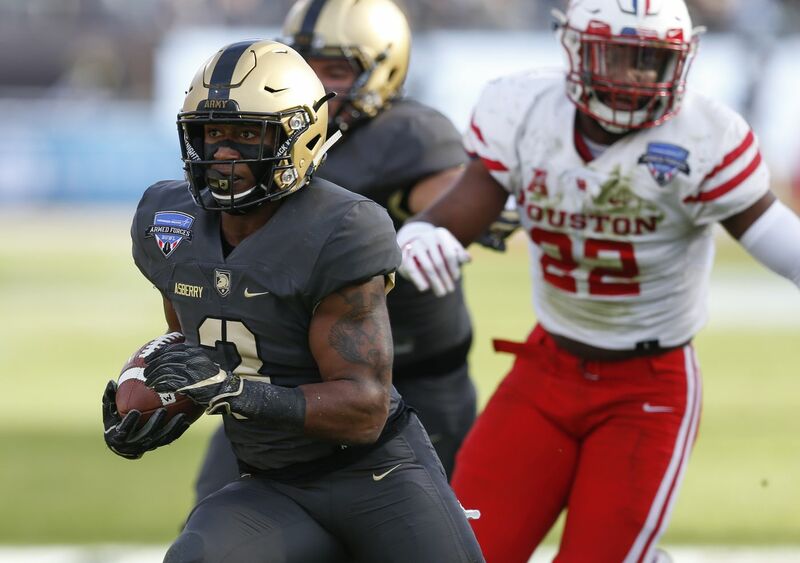 Army West Point came to play, and they played… they played Houston like an absolute fiddle. 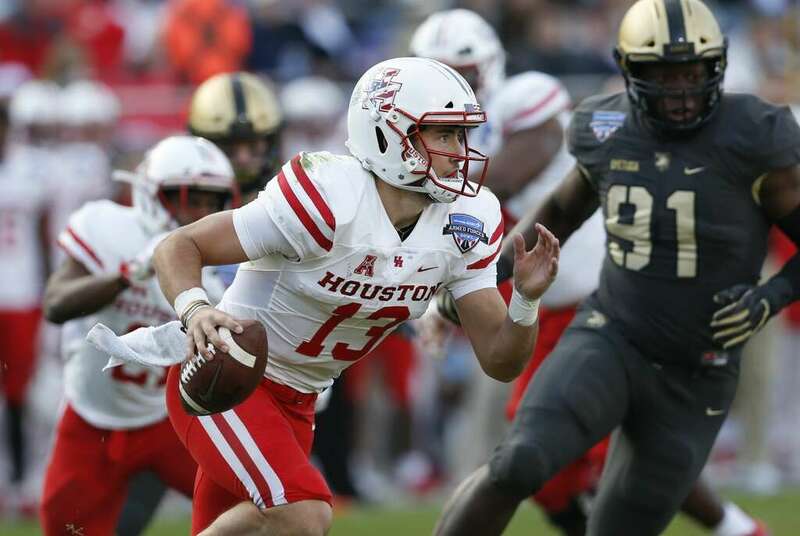 The Black Knights “lightened” the mood a bit by wearing the dress greys with gold helmets, and their *ahem* victims (I’m not even going to bother striking that), the University of Houston Cougars, wore white/white/red, with some new decals for the occasion of the bowl game’s theme. I’m normally not a fan of G.I. Joe demonstrations on a football uniform, but given the context, I’m okay with this, and the game itself was visually pleasant. 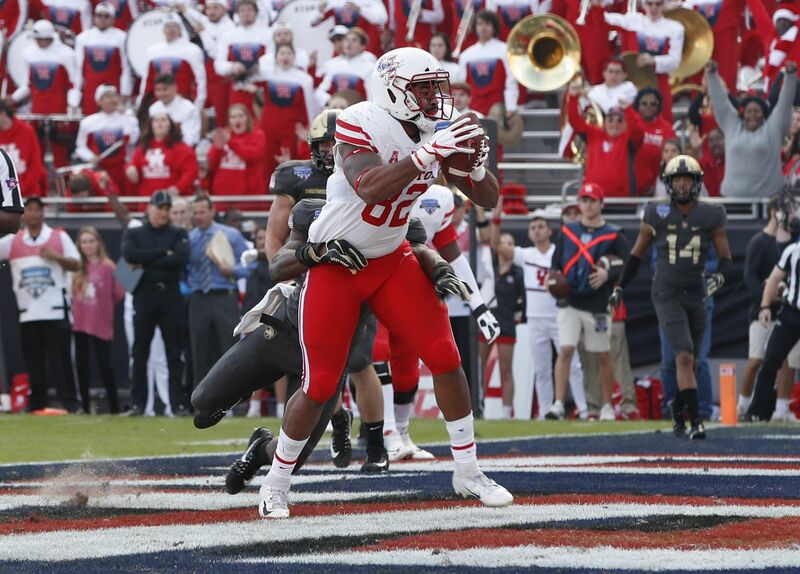 My only complaint was the S&S decal on the right side of Houston’s helmets had the star field facing the wrong way. My rule of thumb is if you’re going to do something, do it the right way. Wait… why does that sound familiar? At any rate, this is a game that Army will remember for years to come, and a game that Houston would quickly like to forget, like that one video game from your childhood that truly channeled inner rage *coughmarioparty2cough*. │Troy vs Buffalo│ And we close things out (don’t worry, I didn’t forget about LA Tech/Hawai’i, that’ll come next week) with a safe-looking matchup between the Troy University Trojans in white/cardinal/white (that’s how Wikipedia lists their color, but it looks a little more maroon to me), and *deep breath*… the State University of New York at Buffalo Bulls… in blue/white/blue. 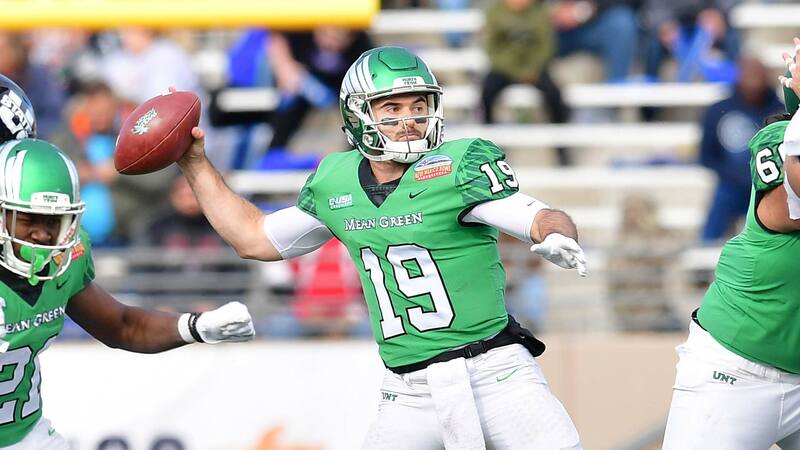 Thanks, TJ — like he said, he’ll have the Hawai’i/La Tech game next week with better pictures (the game ended well after I put this post to bed). 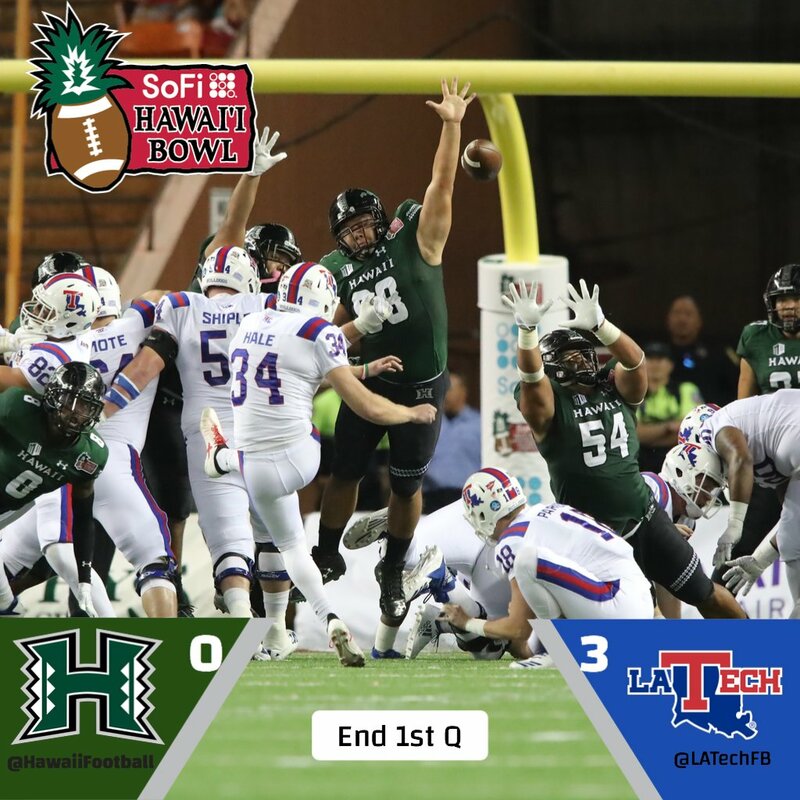 Not bad looking, with La Tech in mono-white and Hawaii in black/green/black. But that will wait till next Sunday. OK, now onto Joe’s 5 & 1 and the trackers. Following in the footsteps of the original “5 & 1,” Jim Vilk, and Catherine Ryan after him, Joe Ringham returned in 2018 to make his “5 & 1” (five good looking and one stinker) uni-vs-uni matchups. Sometimes he had some “honorable mentions” and sometimes there will be more than one “bad” game. You may agree and you may disagree — these are, after all, just opinions and everyone has one. Feel free to let him know what you think in the comments section. Now that the regular season has ended and the bowls are here, Joe will bring us 3 final 5 & 1’s: one each of the next three Sundays covering all the Bowl games (except for the National Championship Game). 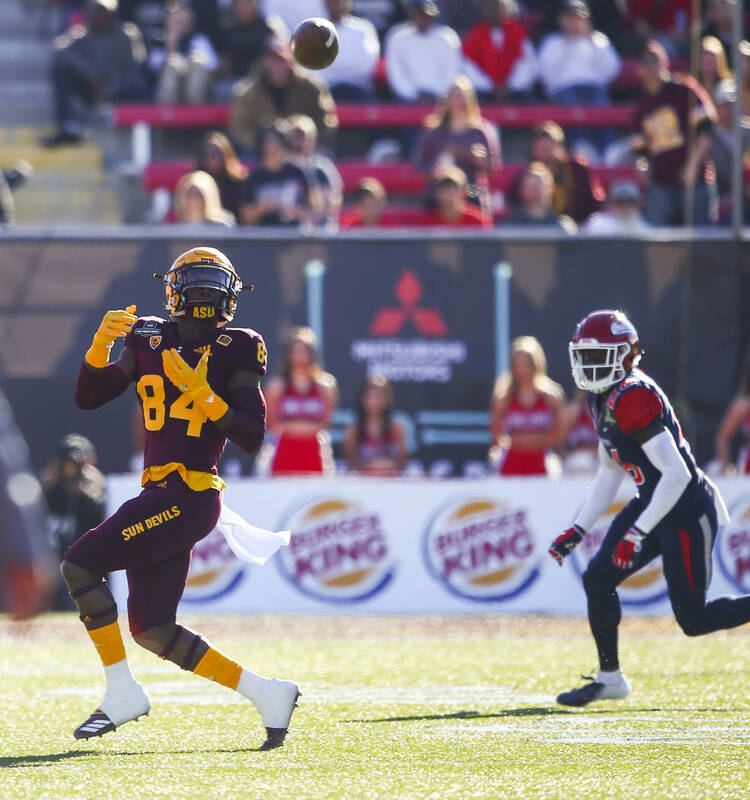 5) Las Vegas Bowl: Arizona State vs Fresno State – We kick off this bowl list with a mono-color vs color clash. Even with how dark the colors were in the bodies of each uniform, I loved how the gold/mono-maroon of ASU clashed against the red/mono-navy of the Bulldogs with the helmets helping make the contrast evident. A very nice-looking game out in Vegas. 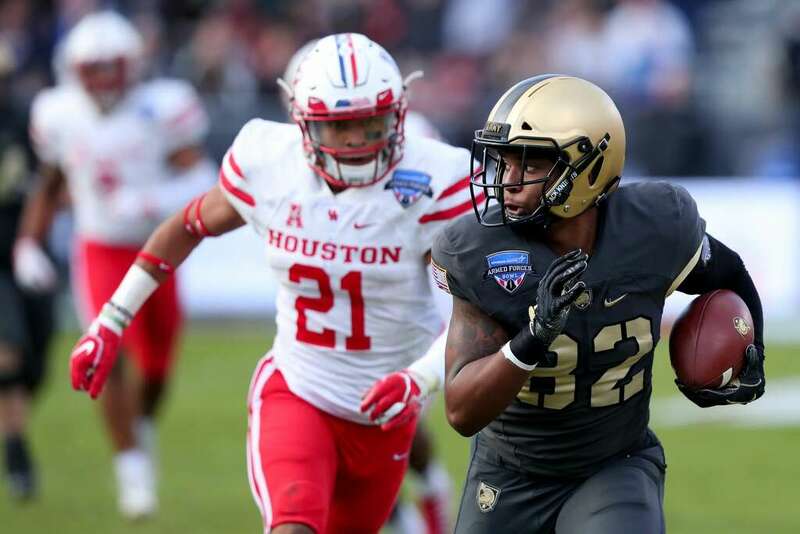 4) Armed Forces Bowl: Houston vs Army – This was a game where the contrast made it stand out to me. 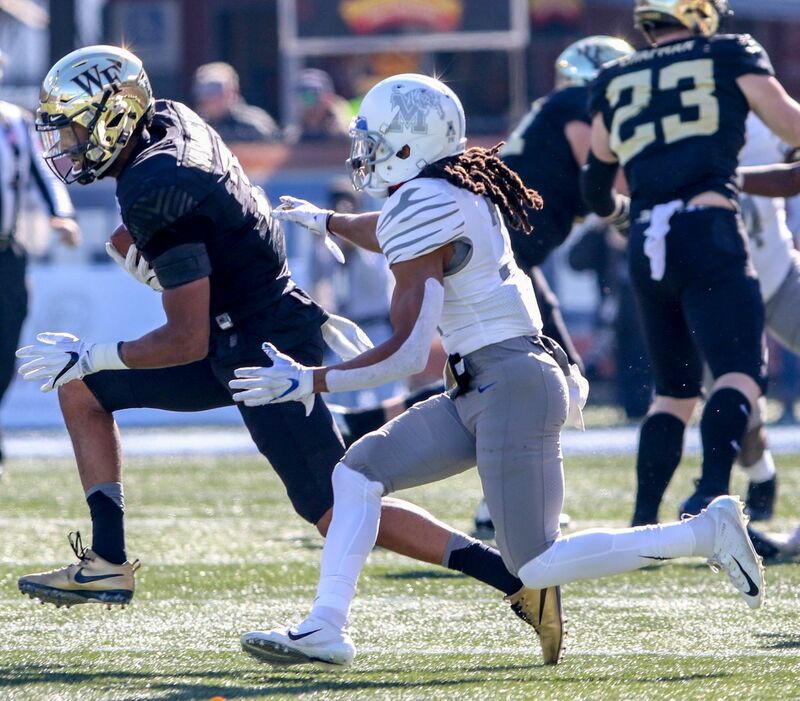 Army, I thought, pulled off their gold/mono-dark gray very well. So well that I thought initially they went mono-black. 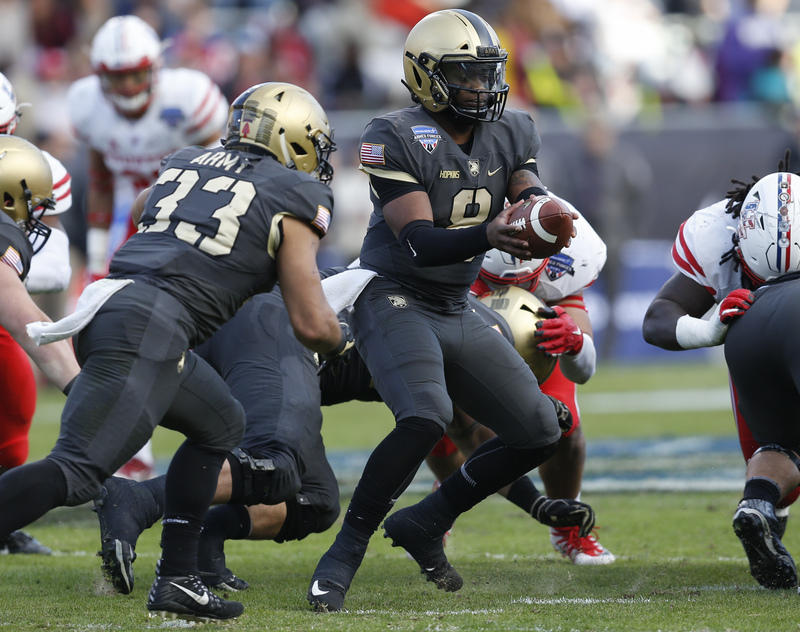 On the other side, the Cougars looked great in white/white/red, and the contrast against Army’s unis was really nice. 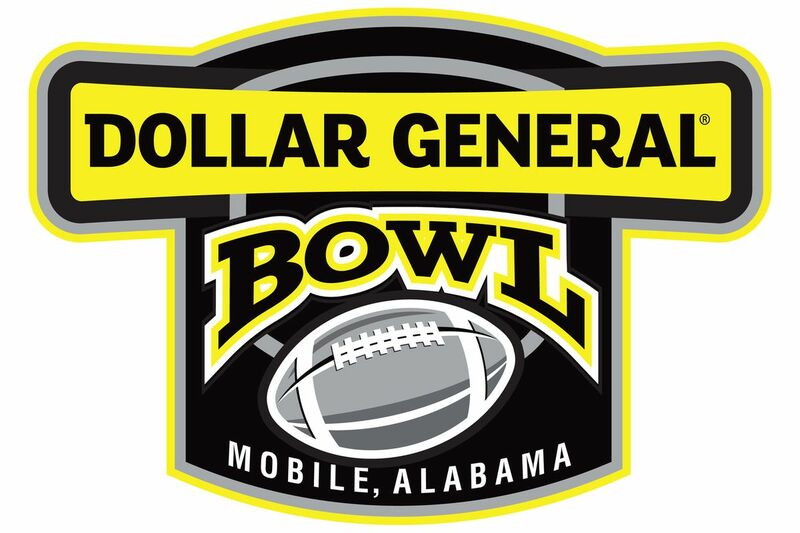 3) Dollar General Bowl: Buffalo vs. Troy – Came across this Saturday night and immediately tagged this one for the good side. 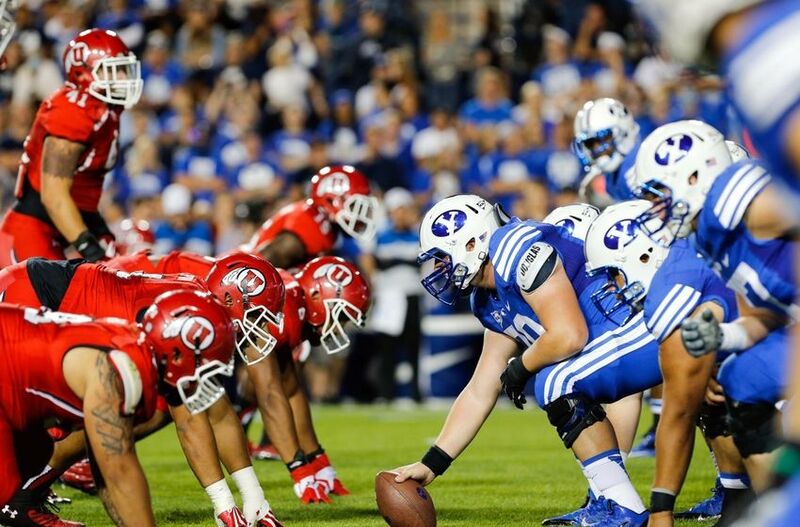 An always great-looking match-up of one team in red vs one team in white. In this case, the white/cardinal/white of Troy looks awesome against the blue/white/blue of the Bulls. Very appealing to the eyes. 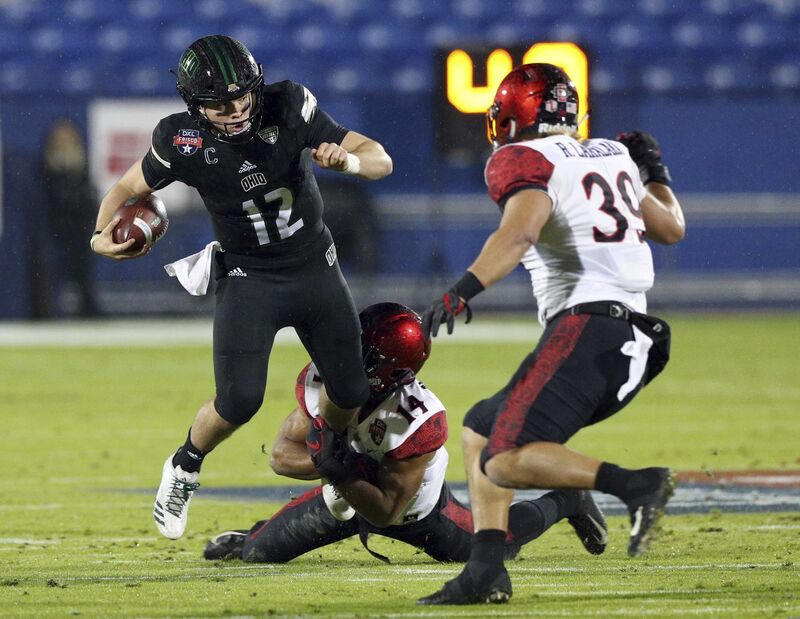 1) Boca Raton Bowl: UAB vs Northern Illinois – Hands down, the best looking game of the first part of the bowl season. And it’s even a Christmas-appropriate color vs color. A great-looking way to kick off the bowl season. 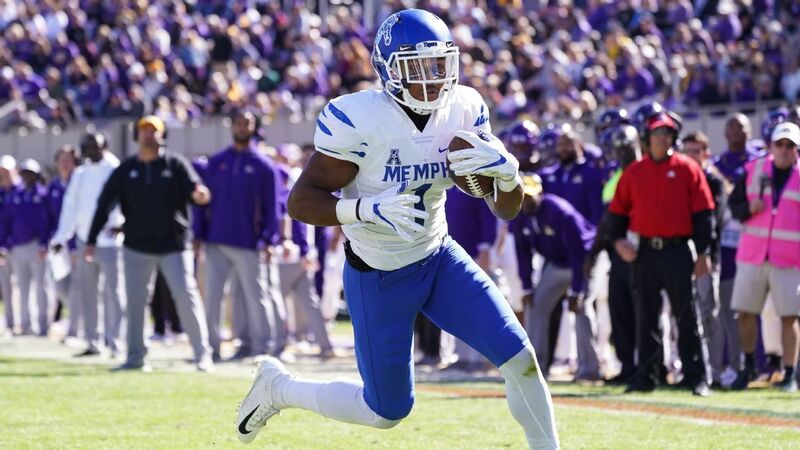 +1) Birmingham Bowl: Memphis vs Wake Forest – This game could’ve been in consideration for the good side of the list had Memphis added even just a tiny bit of blue into the unis. Instead, no blue at all and just a bland looking game. That does it for me this week. Have a very Merry Christmas, and I will see you all again for round two next Sunday. 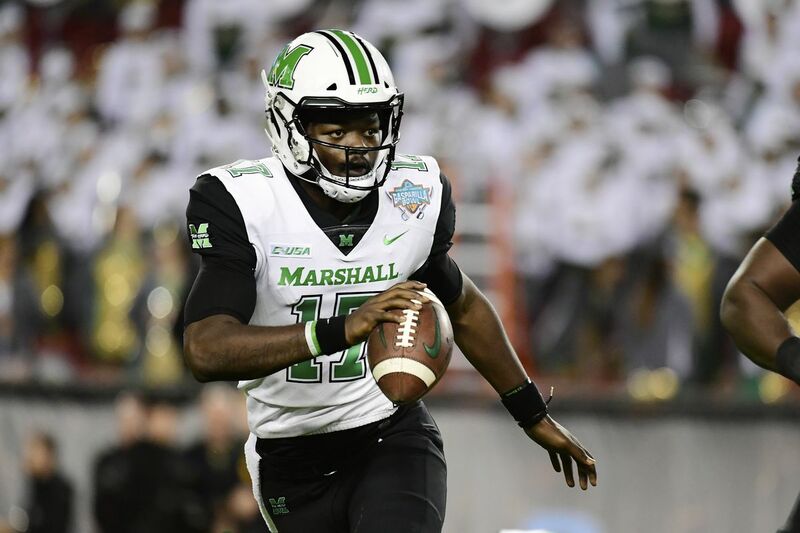 Uni Watch again tracked the uniform combinations worn by the “Power 5” conferences throughout the regular season, and now that we’ve moved into Bowl Season, we’ve got you covered as well. For the first week, only a very few teams (two, in fact) from the Power 5 had games, so I gave my trackers the option to skip the first week wrap if they had teams who didn’t play. The guys have taken the liberty of placing bowl logos beneath the teams who have been chosen to play in them, if their game hasn’t yet taken place. Back for the 2018 bowls are: Rex Henry (tracking the ACC), Dennis Bolt (tracking the PAC-12), Kyle Acker (tracking the Big XII), and Ethan Dimitroff (tracking the B1G AND the SEC). Rex, Dennis, and Kyle and are all returning from 2015, and Ethan is back after joining the NCAA Uni Tracking a couple seasons ago. Ethan continues his dual role of tracking both the B1G and the SEC. Baseball News: In case you missed the big news Friday/Saturday, the Reds and Dodgers completed a yuge trade. “Looking over the #reds roster, looks like Puig will keep No. 66 in Cincinnati. Kemp gets No. 27, Wood gets No. 40, Farmer has No. 52, Roark taking No. 35 and Ervin switches from 27 to 6.” (from our own Alex Hider AND UW Ticker Intern-emeritus Mike Chamernik). 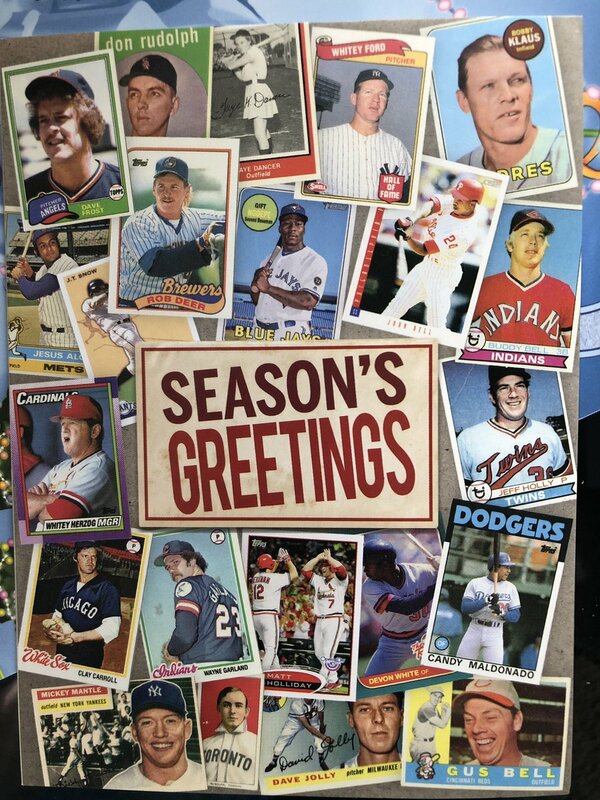 … Joe Nocella received the annual Christmas Card from the BBHOF, and it’s a beaut. 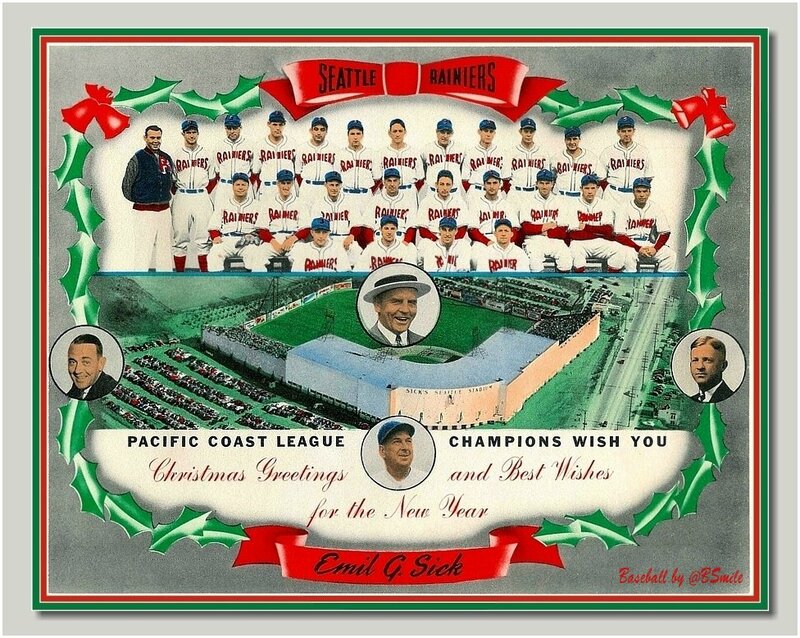 … Here’s an awesome 1940 Christmas card from the Seattle Rainiers Pacific Coast League Champions that season (from Bruce Menard). ,,, The Wheat City Whiskey Jacks, who were formerly nameless, are name and logoless no longer (from Darryl Eagleson). … “Vandy finally got the SEC and Nike logos on different sides of the jersey this year. Always bothered” tweeter Max Herz. NFL News: Hmmm. 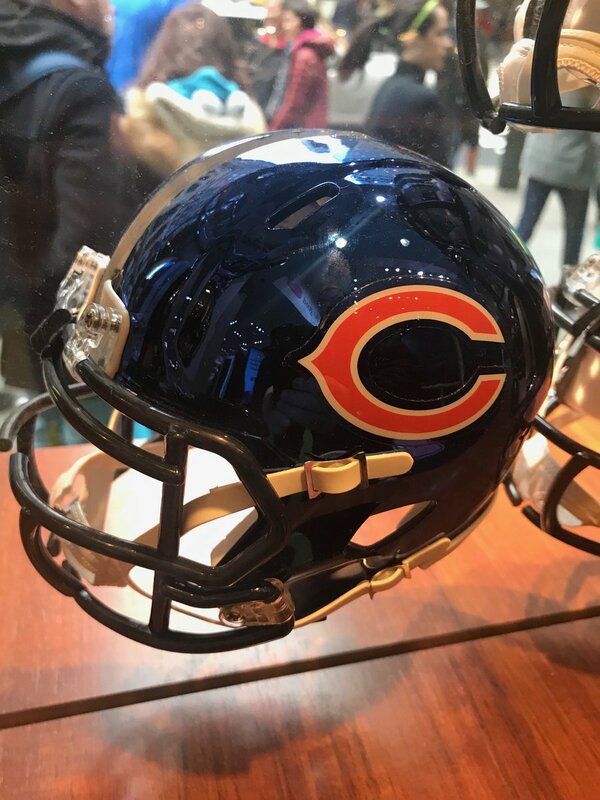 Tom O’Grady found this picture of a Chicago Bears helmet and asks, is it “Metallic Chrome”? Hard to tell from that (and I’m not sure of its provenance), but it looks possible — anyone see any metallic flecks in there? … Today the Buffalo Bills will be going mono-white vs. the Patriots (who are expected to be in their normal navy/silver). And the Saints will be in mono-black. 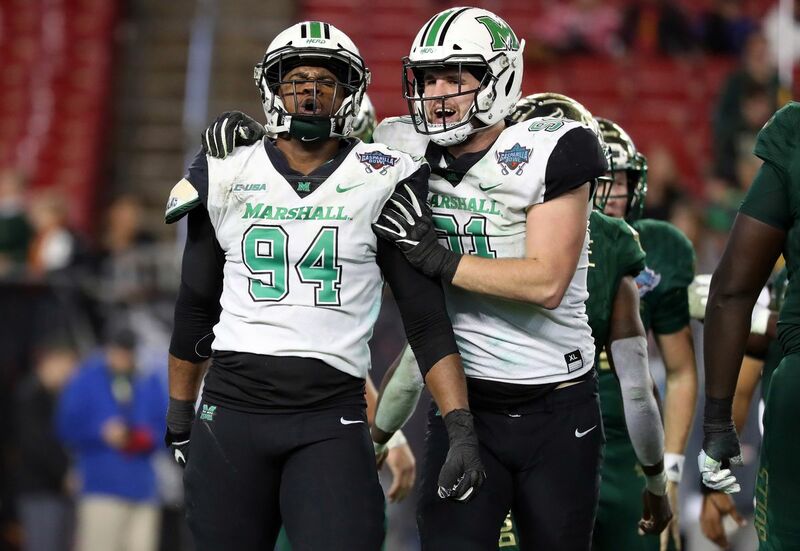 … If you don’t already, you should always check the Gridiron Uniform Database, as they always list all known uni combos for games ahead of time. Looks like we’ll see the Cards in mono-bloodclot, the Panthers in mono-black, and we already knew the Browns will go mono-brown Color Rash and the Dolphins will wear their gorgeous throwbacks. 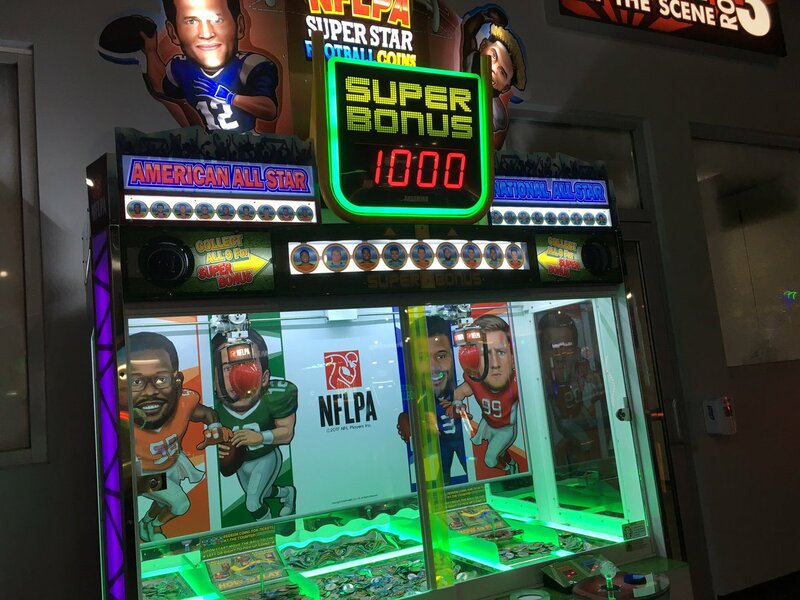 … Tweeter DGFpgh noticed this kids indoor video game place which has an NFLPA-licensed game but no NFL or team logos. … The helmet with communications equipment (remember when we were all *asking* “what is the green dot for?”) is a relatively new phenomenon, but check out this good look at Steve DeBerg’s loudspeaker on his back and the microphone inside his mask, that predates the modern equipment (from vitaxnewsroom). College Football News: Florida will wear its traditional orange helmets with script ‘Gators’ on the side along with white jerseys and blue pants, when they take on Michigan on December 29th in the Peach Bowl. And that of course means Michigan will be in traditional blue & maize (which I don’t believe has happened since the 2010-11 season). … Here’s a breakdown and ranking of the Utah Utes uniforms. … Steven Santillo was watching the ‘77 Sugar Bowl. “It appears that only the skill position players for Pitt have a NOB. This doesn’t include QB Matt Cavanaugh. Wondering if that was typical throughout the 1976 season,” he asks. … More oops! : There was a Tennessee Titans logo on the Armed Forces Bowl gamecast app while playing Washington NFL at the same time (from Kyle Eilts). 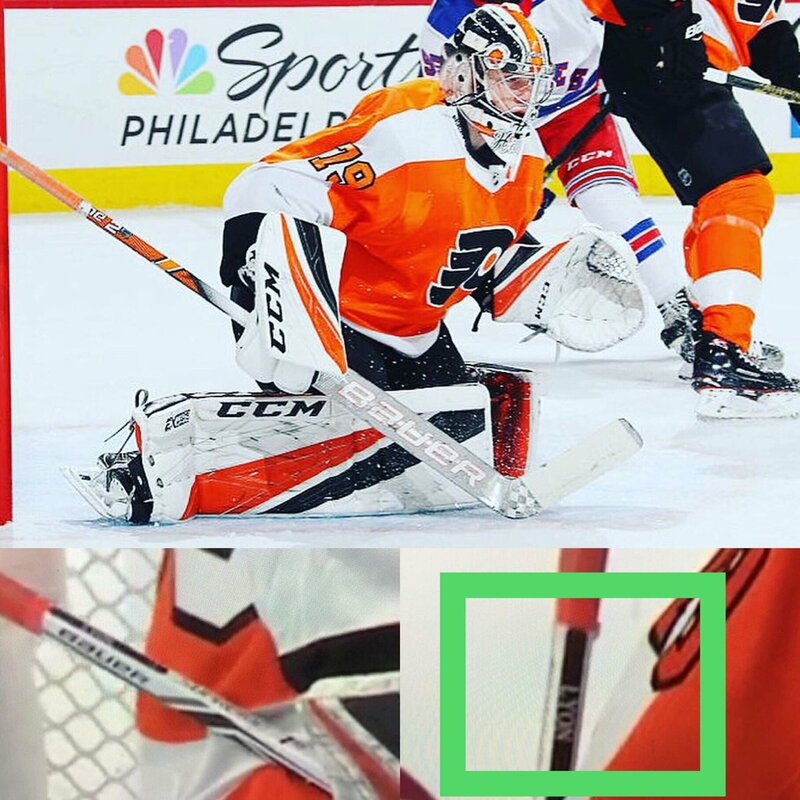 Hockey News: Rookie Flyers goaltender Carter Hart has been using teammate Alex Lyon’s sticks since his call up from the AHL. He changed paddle height right before his call up and still has not received his sticks (from The Goal Net). … There’s ugly sweaters, and Star Wars X-mas getups, and then there are the Orlando Solar Bears, who went full-on Santa Claus with their holiday unis (from Brinke). … Tonight the Carolina Hurricanes will wear Hartford Whalers throwbacks, for the first time since the franchise moved from Hartford (before many of you were born, possibly), and it’s expected to produce mixed emotions. 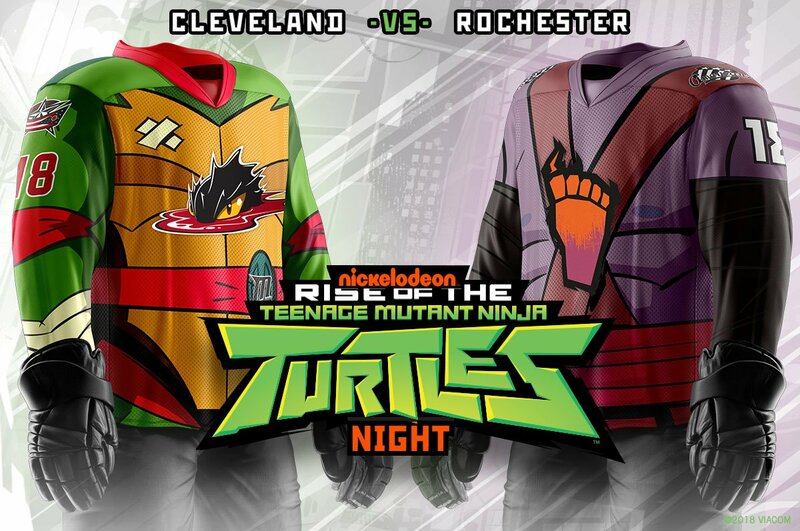 … The Cleveland Monsters and Rochester Americans will wear special costumes (literally) when they hook up in a Boxing Day game of Teenage Mutant Ninja Hockey (from Rusty Flynn). … The LA Kings broke out their silver alternate sweaters on the road yesterday (from Aaryck). NBA News: Is Nike taking this “let’s have lots of color vs. color games” thing too far? 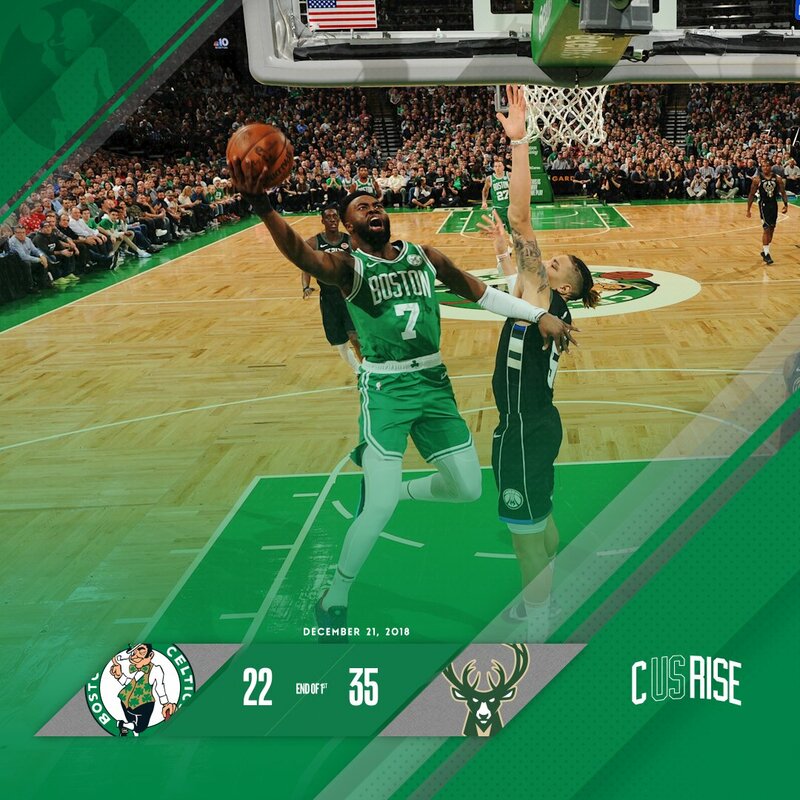 Maybe I shouldn’t blame Nike (though we know they do “script” many of the matchups), but on Friday night, the Celtics and Bucks went green vs. green (thanks to Zak Young and NastySplitter respectively) for the pics. College Hoops News: Oops! 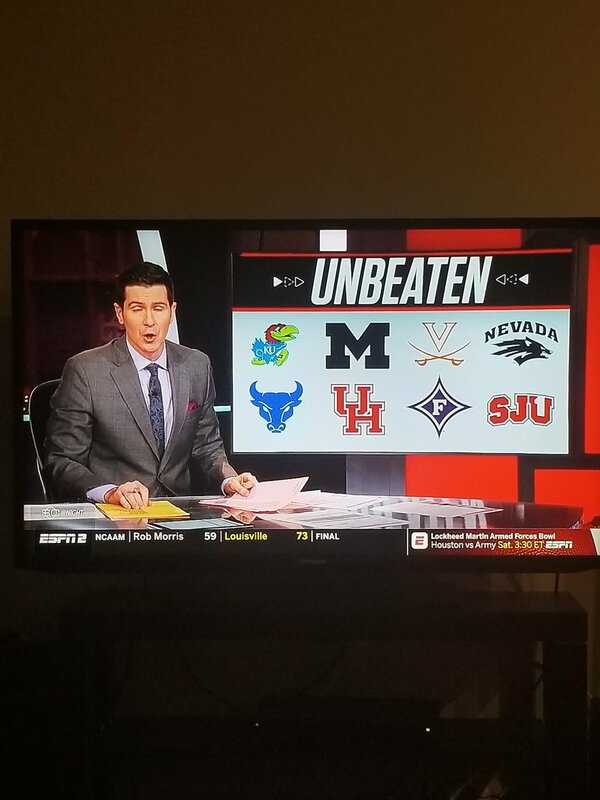 ESPN was using Division 3 Saint John’s logo instead of Division 1 ST. JOHN’S logo (nice spot by Rick Myter). 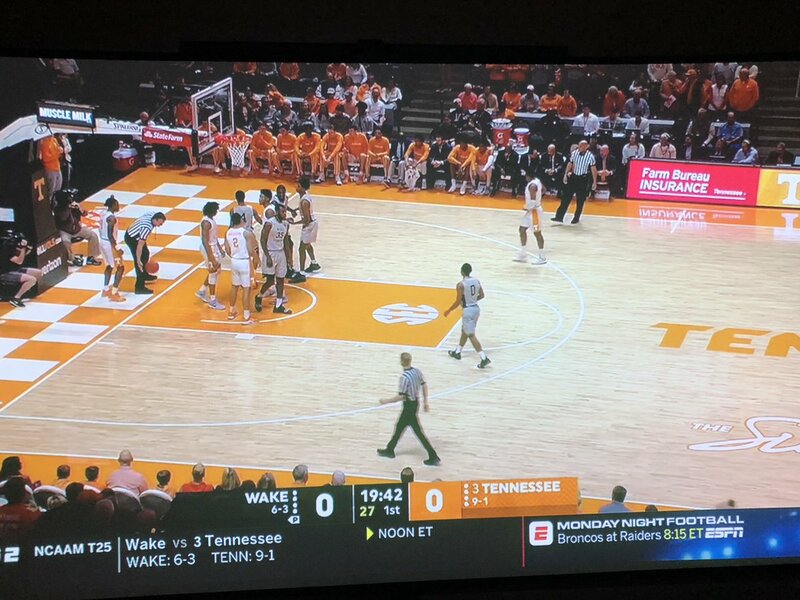 … Sometimes color vs. color is a horrible decision, but white vs. light gray, as seen in this Tennessee/Wake game, isn’t any better (from Matt). … The University of Wisconsin has made the switch from a Sterling (brand) basketball to a Wilson one (from James Gilbert). … Ohio State and UCLA played a color vs. color game yesterday (from Josh Hinton). … Mmmmizzou hoops has a nice new gold set of unis (from Matthew Killmonger). 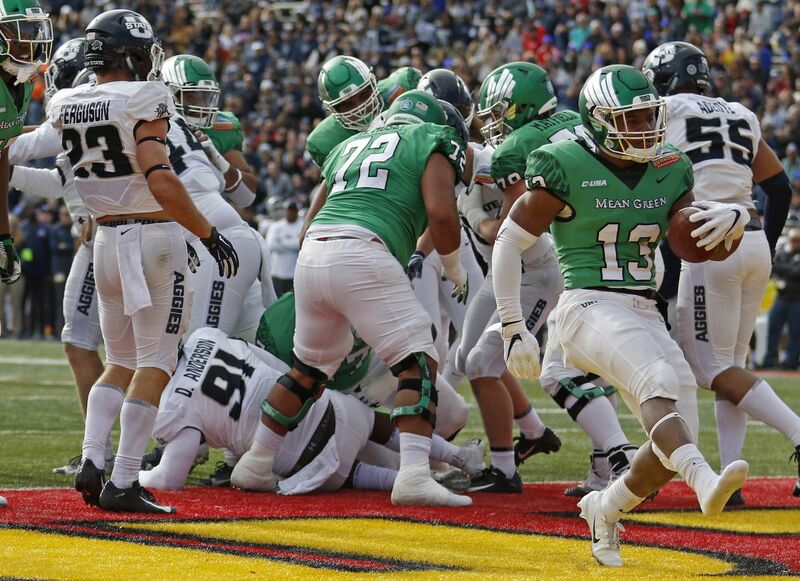 … Yesterday, Hawai’i had retro uniforms vs. UNLV (from Charles George). Soccer News: LGR Sportswear, local brand and official supplier for the Philippines national team, has shared a first teaser of the new kit set to be worn at the 2019 Asia Cup (from Josh Hinton). Bucks’ green is much darker and indistinguishable from the black. It’s the same predicament that the NHL’s Dallas Stars faced before unveiling a lighter victory green. Bucks wore black last Friday against the Celtics’ green. Very hard to tell since the Bucks’ green is a lot darker and very difficult to distinguish from the black. The Dallas Stars faced the same predicament prior to unveiling the lighter victory green shade. 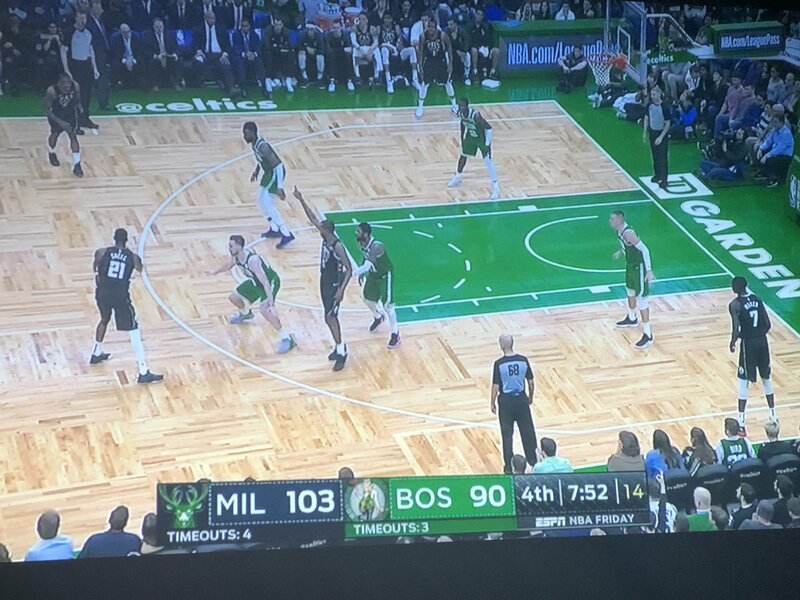 The Celtics & Bucks went green vs green? Aren’t the Bucks wearing black? The Bucks were wearing their black “statement edition” jerseys. Regarding Pitt in the 1977 Sugar Bowl – the skill players like Dorset and Cavanaugh were wearing tear-away jerseys. I suspect that the ran out of Cavanaugh jerseys with his name on them. The other players are wearing fishnet jerseys instead of their normal closed-mesh jerseys so Pitt probably just got them for the game. They almost look like practice jerseys but I don’t remember anything about their normal road jerseys going missing before the game. Those 76 Sugar Bowl unis are a strange story. Only a handful of players had tearaways with normal graphics and school colors and that set of away jerseys the other players wore didn’t appear any other time that season. The blue version of that set appeared in similar fashion (with a handful of players wearing more normal looking tearaways) for the opener in 1977 against Notre Dame (won by ND with Matt Cavanaugh breaking his wrist, ruining what could have been a back to back National Championship caliber team). I don’t think the plain practice-looking jerseys ever appeared again. Pitt uni watchers have always known that the 70s were an absolute mess with sometimes 4 or 5 different jersey styles worn in the same game. Different meshs, different stripe patterns, different numeral graphics, different nameplate styles were all part of the equation. It was so bad Pitt could have practically played inter-squad scrimmages during some games! In the annals of mismatched unis on the same team Pitt has to be the all-time leader. But the gorgeous mustard clear-shell helmets made up for it! Here’s the full story on that Steve DeBerg microphone setup. In honor of Festivas I will air my grievance on Color vs Color. This should only be done if there is plenty of contrast. The USC/UCLA game is the gold standard for the best color vs color game, and this has even lost a little of it’s greatness with UCLA darkening up it’s blue over the years. Most should just forget it, like the Georgia vs Florida game. I’ve got a lot of problems with FIFA, but soccer’s rules on color contrast should be applied to every league in every sport. And the lead referee should have the authority to enforce by offering the home team a choice before the start of the game: Change or forfeit. Further to the Grab Bag ticker item. 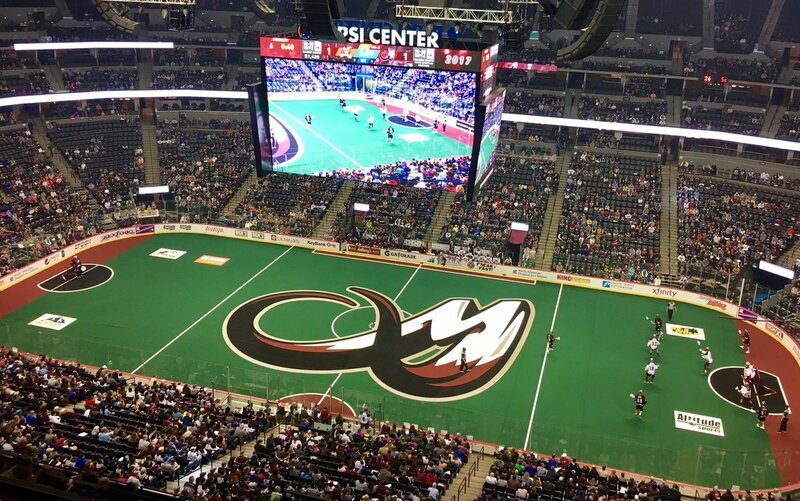 The NLL Colorado Mammoth do not have the exact same number font as the Colorado Avalanche if you look closely. KSE did manage to go large for the Mammoth when it comes to the turf. Believe it has to be the largest centre floor logo in the league. 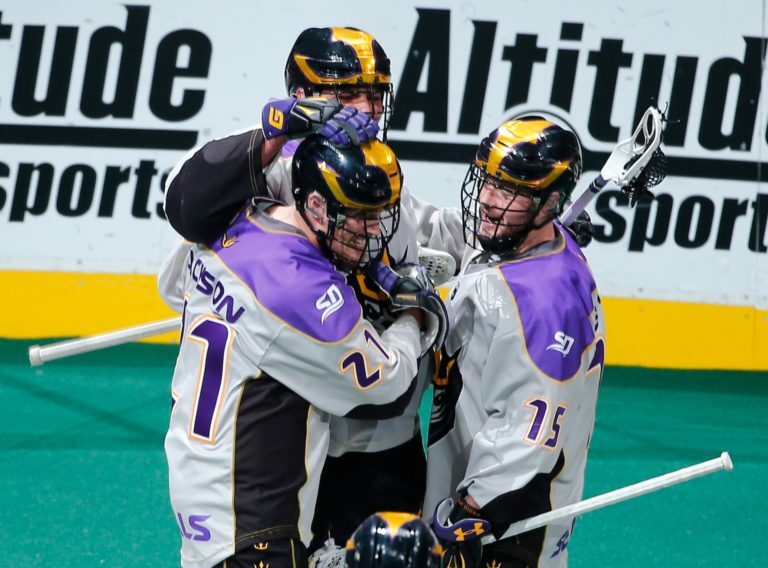 Since we are talking Colorado Mammoth and NLL, might as well mention that Colorado hosted the San Diego Seals last night. Bucks-Celtics was green vs. black. Dumb and hard to watch, but not green vs. green. Yep. Not sure why they thought the Bucks were wearing green. Paul posted the recipe earlier this week. The Pitt item hits one of my old man get off my yard sore spots—the term ‘skill’ players and the implication that players that don’t play those positions are unskilled or even that skill position players are inherently better football players. I hold that in a lot of games, the best player on the field is probably a lineman. That being said, those Mizzou basketball unis are a nice color. Not too sure about the helmet logo on the chest, though. Troy wears cardinal. There’s no “that’s how wikipedia lists it.” Cardinal is the official color. And if you compare Troy’s red to that of what Mississippi State wears there’s no real comparison. MSU’s maroon is much, much darker than Troy’s cardinal. MSU’s 505 is a great deal darker. Stanford, by comparison, lists 201 as their “cardinal red” which is much closer to Troy’s 202. Gotcha. I didn’t want to subscribe to an absolute that I was unsure of, so I played it kind of safe, as opposed to risking going by X source, and then I look like Boo-Boo the Fool if it’s wrong. 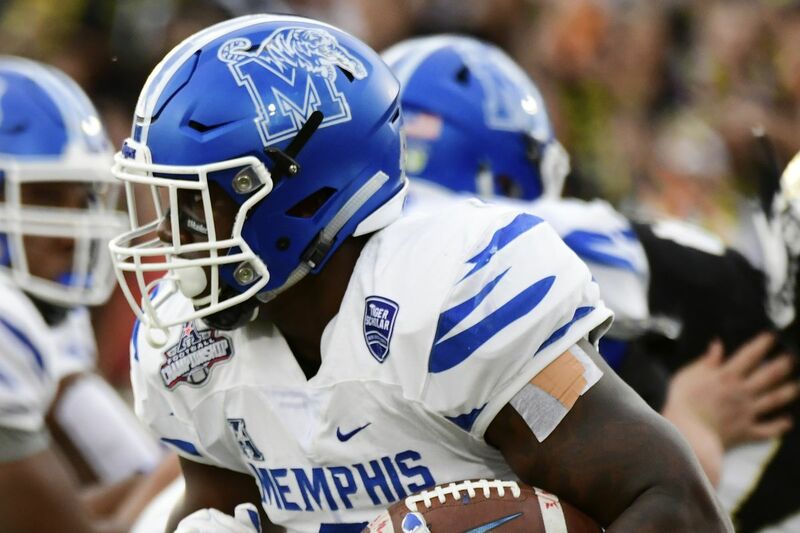 Worst FBS uni of the week has to be Memphis and they gray & white washout look. You had to squint to make out jersey numbers. They reminded me of something a high school team would wear for practices. Blue is one of their school colors. No blue in sight, unless you can find a pair of gloves with a bit of blue trim. No surprise that they lost. ESPN’s horrible for updates. I have seen negative scores, incorrect team logos, the same name listed for every position lol. The list goes on. Here’s hoping the jerseys are better. Either Hewey, Dewey or Louie didn’t age well. Cowboys wore blue jerseys (with white pants) against the Giants at Met Life last December. Upon further review my dumbass missed that but still very interesting that we’ve only worn it against them once I know the cowboys wear white at home obviously and then end up wearing white on the road more often than not but still an interesting anomaly thanks!